Again, Border Security Force wants to draw your attention towards newly advertised vacant posts of Constable (Tradesmen) for Male candidates on its portal and would like to ask for the highly interested applicants to do submission of the application before the deadline. If you are interested in this employment and possess all of the qualifications as per the required eligibility criteria, then it is a good job option for and you must not miss out on this one; rather be the one to download Notification from this page and apply right away. No matter which qualifications you possess, this blog will always bring you the most recent updates from the BSF's portal directly. 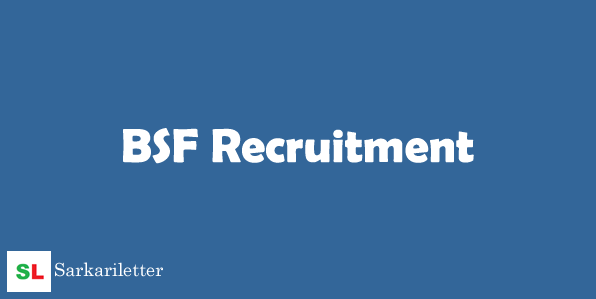 If you really do not want to miss out on any job opportunity from BSF, you will certainly bookmark this blog and keep yourself up-to-date with reference to all upcoming jobs in BSF. जी हाँ! अगर आप बॉर्डर सिक्यूरिटी फाॅर्स से आने वाले समय में कोई भी रिक्रूटमेंट को मिस नहीं करना चाहते तो आज ही इस प्रष्ठ को बुकमार्क कीजिए ताकि हम आको जल्द से जल्द आने वाली भर्तियों के बारे में जानकारियाँ प्रदान करा सकें. धन्यवाद्! अन्य अपडेट के लिए हमारी वेबसाइट सरकारी लैटर को विज़िट करते रहिये. To select the best candidates, the body shall conduct a Physical Standard Test (PST), Physical Efficiency Test (PET), Documentation, Trade Test (TT), Written Exam, and a Medical Examination. In this phase, the aspirants have to bring all of the Original Documents as said in the Notification. What is more about PET? In PET, there shall be a 5-kilometre Race which has to be completed within 24 minutes. The trade test is of qualifying nature. Only one candidate can appear for Trade Test once. You can find detailed information about the Written Exam and Medical Exam using the Advertisement as given below. The applicants must be an India to apply. This includes holding a Matriculation certification or its equivalent certificate from a well-known university with a 2-year work experience in respective trade. Or, the aspirants need possess 1-year course from ITI of Vocational Institute or 2-year diploma in ITI in the respective trade. There is no application fee, however, the applicants have to put a stamp worth Rs.40/- on the application while sending it to the postal address. How to Apply for BSF Vacancy? To apply, what you need to do is check out links as brought to you in the following section. Remember to keep track of the important dates so that you don’t miss out on anything special. If you have any question, please ask in the comment.